A Saudi public prosecutor has said that Washington Post journalist Jamal Khashoggi's killing was premeditated, citing a Turkish-Saudi joint probe, Saudi media reported Thursday. The statement contradicts the earlier official line that the Saudi dissident journalist was killed in a botched operation to "negotiate" his return to the kingdom. Initially, Riyadh denied having anything to do with Khashoggi's disappearance after he entered the Saudi consulate in Istanbul on Oct. 2. "Information has come from the Turkish side indicating that the suspects in the Khashoggi case embarked on their act with a premeditated intention," the prosecutor added in a statement, carried by the state Saudi news agency SPA. Turkey and Western allies of Riyadh have voiced deep doubt towards Saudi explanations of the killing. Turkey has dismissed Saudi efforts to blame rogue operatives and urged the kingdom to search "top to bottom" for those responsible for the killing. President Recep Tayyip Erdoğan spoke to Saudi Arabia's de facto ruler, Crown Prince Mohammed bin Salman, and the two discussed the steps needed to bring to light all aspects of the killing on Wednesday. On Wednesday, U.S. President Donald Trump was quoted by the Wall Street Journal as saying that as Riyadh's paramount ruler, Prince Mohammed bore ultimate responsibility for the operation that led to Khashoggi's death. In a separate statement, SPA said the crown prince presided over the first meeting of a committee to restructure the kingdom's intelligence services. The meeting evaluated current practices and set up recommendations to improve the agencies' work, it said. British Prime Minister Theresa May joined other Western leaders on Wednesday and expressed skepticism about the Saudi explanation of Khashoggi's death, saying it lacked credibility. 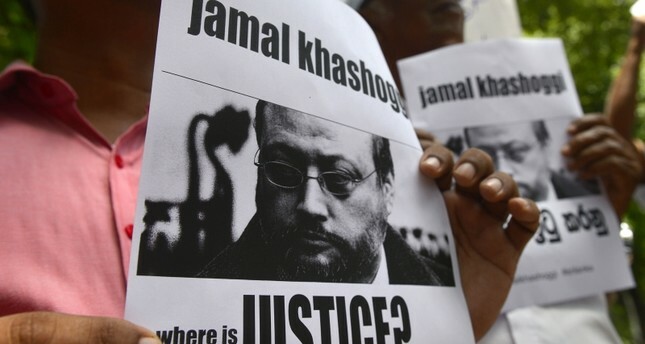 Saudi Energy Minister Khalid Al Falih conceded on Wednesday that the scandal over Khashoggi had hurt the kingdom's image. "It's not a death, it's a murder. We admit it, we're dealing with it. As such, we will be transparent and show our allies and friends in the United States ... that the kingdom is as unhappy about what has happened as anybody else," he told CNN on the sidelines of an investment conference in the capital Riyadh. "In fact, we are more unhappy because it has tarnished the name of the kingdom," he added.